Indonesian President Susilo Bambang Yudhoyono tapped Trade Minister Mari Pangestu to run the country’s tourism and creative economy ministry in a cabinet shuffle as the second-term leader faces falling approval ratings. Pangestu, 54, was appointed trade minister in 2004, when Yudhoyono was elected to his first term. She was an executive director at Jakarta-based Centre for Strategic and International Studies before that. 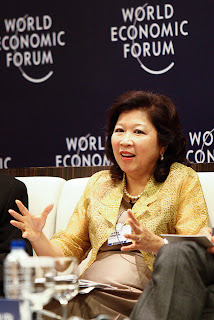 She will be succeeded by Gita Wirjawan, 46, currently head of the government’s investment coordinating board. Yudhoyono won a second five-year term with 61 percent of the vote in 2009 on pledges to boost the economy, double infrastructure spending and clean up graft. His public support has fallen amid complaints he’s been slow to act, and after the former treasurer of his Democrat party was accused of corruption. Support reached a record low 46.2 percent in a nationwide survey by Jakarta-based Indonesian Survey Circle, taken Oct. 5-10. Yudhoyono said developing the country’s domestic economy is a priority for the remainder of his final term as president.